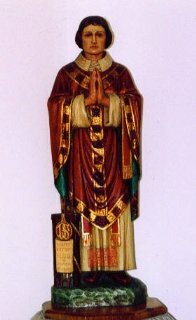 This statue is to be found in the Catholic church in Lutterworth. It was from Lutterworth that Robert Sutton, then Vicar of the Protestant Parish, fled with his brother to France. ​There they attended Seminary and Robert returned to celebrate Mass for the Catholics in this area, finally being arrested, tortured and executed for treason.